Purchase a raft or cataraft and get 15% off ALL of your accessories (frame, cooler, oars, drysuit, you name it)! Use coupon code 15OFF when ordering. Discount will only apply after a boat has been added to your cart. There is nothing better than catching fish with friends and there is no better rig to do it in than the NRS Otter 130 Self-Bailing Fishing Package. The Otter 130 Self-Bailing 13' raft is a versatile design that works perfectly for any fishing excursion or multi-day trip down the river. High quality Pennel Orca® tubes and floor, HD40 tube armor and a frame chafe guard make this one heck of a tough boat. A three chamber tube construction ensures you have buoyancy in case of an accident. Reattach the two removable thwarts to make this into a great paddle boat for the whole family. 12 stainless steel 2" D-rings and 4 carrying handles round out this great boat. 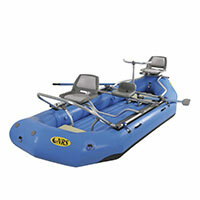 The NRS Fishing Raft Frame is ideal for a day out on the river catching fish. You get a comfortable rowers seat and a raised High- Back Swivel Seat that puts the angler up high for ease of casting. The Stern Seat Mount gives you room for another angler in the back of the boat, with a High-Back Swivel Seat that allows you to fish at any angle. Front and rear casting platforms give you a place to stand up with solid, secure footing. A U-Shaped Thigh Bar gives added stability for the front angler while the Rear "Y" Thigh Bar does the same in the back. Seven 3' Clavey 1" Poly Straps will secure the frame to your boat. $99 Kayak, Canoe, Raft or Stand Up Paddleboard Shipping: For $99 Clavey will ship your kayak, canoe, raft or SUP to the nearest Distribution Center of the shipping company. Typically this will be in the nearest large metropolitan center to your home. Clavey will contact you with the location and date of arrival as well as contact information and hours of operation. $149 Residential Direct Shipping: For an additional $50 Clavey can ship your order directly to your house. *These prices are per kayak, raft, canoe or SUP and do not include shipping outside of the continental United States. All orders shipped outside the 48 contiguous states will receive a separate freight quote. Please contact us if you have any questions. 10% Accessory Discount: Any accessories (paddles, lifejackets, car racks, etc.) ordered at the time of your kayak, canoe or stand up paddleboard will receive a 10% discount and be shipped with your watercraft at no additional charge.